President Jacob Zuma, looks on at the African National Congress (ANC) elective conference in Johannesburg. 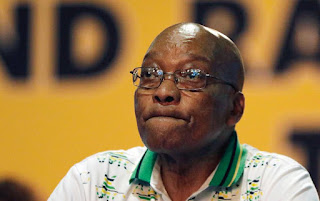 The director of South Africa's National Prosecuting Authority says that former president Jacob Zuma will be prosecuted on 16 charges of corruption. Shaun Abrahams announced Friday, March 16, 2018 that Zuma will be face charges including fraud, corruption, racketeering and money laundering. Shaun Abrahams, head of the National Prosecuting Authority, noted the "long history" of the reinstated charges against Zuma, which were thrown out by prosecutors nearly a decade ago in a contentious decision that opened the way for him to become president. The charges relate to an arms deal in the 1990s, when Zuma was deputy president. "After consideration of the matter, I am of the view that there are reasonable prospects of a successful prosecution of Mr. Zuma on the charges listed in the indictment," Abrahams said. The chief prosecutor said there were 16 counts against Zuma, and that the former president had said he was a victim of misconduct by prosecutors as well as leaks to the media. "Mr. Zuma in addition disputes all the allegations against him and records that he lacked the requisite intention to commit any of the crimes listed in the indictment," said Abrahams, who himself faced calls to resign for allegedly declining to move against Zuma when he was in office. Zuma, 75, resigned as president last month after he was ordered to do so by his party, the African National Congress. He was replaced by his deputy, Cyril Ramaphosa, who has promised a robust campaign against corruption and also faces the tough task of rebuilding the popularity of a ruling party whose moral stature has diminished since it took power at the end of white minority rule in 1994. The ANC responded to the reinstated charges against Zuma, saying it has confidence in the South African criminal justice system and is committed to the idea of "equality of all before the law." The ruling party urged South Africans to allow prosecutors to do their work and cautioned that Zuma has the right to be "presumed innocent until and if proven guilty." In a separate case, South African authorities are seeking to arrest members of the Gupta business family, which allegedly used its connections to Zuma to influence Cabinet appointments and win state contracts. Additionally, a judicial panel is preparing to view allegations of corruption at high levels of the South African government during Zuma's years in office. In another scandal, South Africa's top court ruled in 2016 that Zuma violated the constitution following an investigation of multi-million-dollar upgrades to his private home using state funds. He paid back some of the money. South Africa's main opposition party, which fought for years in court to get charges reinstated against Zuma, welcomed Abrahams' decision. "Now there must be no further delay in starting the trial," said Mmusi Maimane, leader of the opposition Democratic Alliance. "The witnesses are ready, the evidence is strong, and Jacob Zuma must finally have his day in court."